I know some of you will be familiar with that term, but for those of you who aren't, a brief explanation seems in order. The Wilhelm Scream, is one of the most famous stock sound effects in movie history. It's been used in hundreds of films, TV shows and video games. It's named after a character in the first movie it was used for (Distant Drums 1951). For a long while it's been somewhat of an in-joke between sound editors. Ben Burt, who did the sound for all the Indiana Jones and Star Wars films included it in each one. At any rate, when it was suggested that I run the numbers, not on the actor who created it, but the scream itself, well, how could I resist? It's not really known for sure who recorded the famous scream as it was a stock sound recorded after the movie, but it is generally thought to be Sheb Wooley (Purple People Eater) who as it happens, was one of the actors that came in to record screams and other sounds on the film. Regardless of who it was, you can see by the numbers that it's done well for itself. At 67% positive over 33% negative, it's officially a good actor. Not bad for a career made out of one line. I should also note that as there really isn't any way of knowing officially how many movies the effect has been used in, the numbers could slide one way or the other. Learn something new every time I come here. 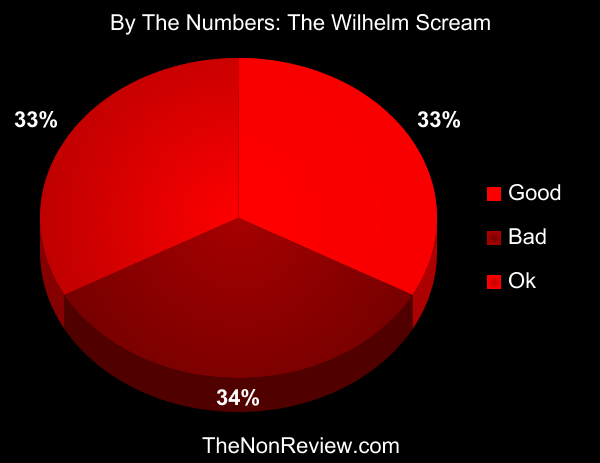 I'd never heard of the "Wilhelm Scream" before now! That series of snippets was pretty funny. Sheb kind of has a girlie scream. Interesting post. PS If you are reading this (or even if you aren't) it seems your problem with disqus has been fixed. Woohoo. Woot! I was missing by the numbers! Those numbers are pretty close! This post takes me back to my old days in radio advertising when we used to do "scream" wild reads. And no, you've probably never heard one of my commercials. Sadly. Weird that you posted this. Yesterday I started listening to a band again, that originally, I hadn't given enough time to. 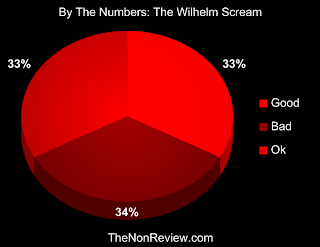 Their name: A Wilhelm Scream. SPoooooooooky. You know, I've heard of them but never tried them. I'll have to give a listen. Haha! 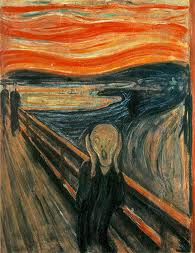 It's not even a very good scream! Haha! Aaaiiiiaahhh! Very nicely done. I have read and heard this several times and it has stood the test of time. Well done. I don't think I have ever heard of this. That's crazy. Okay, you're gonna think I have really lost it, but I was a HUGE fan of the show Little House (ya know, Laura Ingalls) ... Whenever they had a scene with kids playing in the background, you would hear the same loop. I know this because I could identify a child yelling, "Nelly, Willy catch up!" I swear to you, TS this same loop of kids playing in a school yard was heard on many other shows back around that time. I wish I could find it to confirm. Now that scream is going to be stuck in my head all day. I'm so sorry I missed this. That was great. Thanks for doing it. And yes, I did think you forgot about me. I'm glad it did so well, considering it might be the most prolific "actor" in Hollywood. And what a long career!